Alliance Group’s profit this year will be “substantially up” on last year’s result, chief executive David Surveyor says. Speaking at a roadshow meeting in Waimate last week, Mr Surveyor could not give a figure as he did not yet have the audited accounts, but said a pool payment would also be made. Last year, the company posted a pre-tax profit of $10.1million for the year ended September 30, based on a turnover of $1.36billion. Last year’s debt figure of $41million would be halved to somewhere around the $20million mark, Mr Surveyor said. . .
What more could a sheep want? I’m just a farmer. Not an “invisible farmer”, not a “woman in ag”, just a farmer. Being able to prime a pump and drain a sump does not make me exceptional either. Just another farmer. I’m not sure, really, why there are so many women-in-ag groups. Their existence suggests the female form is somehow a problem when it comes to twisting wire into a figure 8 knot or developing a new plot. It’s not. All my life, I’ve watched women farmers at work. My grandmother, mother, neighbours and friends. There’s nothing new – or second-rate – about female farmers. . .
New Zealand’s Tamarillo Co-operative has signed a major deal with a distributor allowing Tamarillo Marinade and Tamarillo Vinegar to be sold in the US and Canada. The first of shipment of tamarillo pulp has left Whangarei for US-based food producer and distributor, Serious Foodie. Tamarillos are processed into pulp and vinegar concentrate in New Zealand and exported to Serious Foodie in bulk. Florida-based Serious Foodie then makes the pulp into Tamarillo Marinade and Tamarillo Vinegar. . .
Agri family businesses that have a trust structure need to make sure they’re not burnt by the changes in legislation that governs trusts. Crowe Horwath Business Advisory Partner Denis Hames says neglecting your family trust has never been a good idea and in light of the new Trusts Bill currently going through parliament, which would tighten up the obligations and responsibilities of trustees, trusts will need to be reviewed to ensure their ‘fitness’ in the current environment. . .
A South Waikato ginseng producer is ready to approach potential investors to increase its production and exports with the help of funding of up to $40,000 from the Ministry for Primary Industries (MPI). Maraeroa has 20 hectares of high value wild simulated Asian panax ginseng growing on the forest floor of its 5,550 hectare pine plantation. The group is looking to double the size of its ginseng plantation by raising capital and having a purpose designed processing factory built at Pureora. . .
I’ve quite often read or heard over the last few months that each dairy cow produces the waste of 14 humans, which apparently translates into New Zealand having to deal with the waste of an equivalent population of 90 million people. Often the implication is that all of this waste is washed straight into our rivers and waterways. ​What is conveniently left out of this argument put forward by our critics is that the vast majority of cow No 2s are deposited straight back onto the land, to be broken down by microbes and become part of the top soil, boosting fertility and being used to grow more grass to feed cows. What a great system for dealing with waste! . .
A summer-long on-farm study of irrigation efficiency in the Ashburton area will provide a benchmark for progress. This is the message from study leader, IrrigationNZ project manager, Steve Breneger. In partnership with Environment Canterbury, INZ employed post-graduate environmental science students to collect data for four months, looking at how farmers were operating equipment, applying water, scheduling maintenance and monitoring soil moisture and run-off. . .
Farmers’ efforts to cut costs after some tough seasons have not dampened their appetite for adopting technology that will help them produce more from less. This year’s Mystery Creek Fieldays was dominated by the usual swathe of latest hardware for farm use but agri-tech companies reported farmers most interested in technology to help them generate greater profits from more stripped down, pasture-focused systems. That was also being pushed harder by regulatory requirements around animal identification and environmental controls, both requiring better technology to keep operations compliant. . .
Four years after the concept came to him and on his first time at the National Fieldays Darren Bainbridge won four innovation awards for his electronic MyApiary products. With co-founder Carl Vink, Bainbridge creamed the awards among 80 entrants with their cloud-based operations management tool for beekeeping. The custom-built tool was delivered on licence for the required number of users, effectively making MyApiary the IT provider for the beekeeper. All of the biggest bee companies had shown interest in the service, Bainbridge said. . .
Primary Industries Minister Nathan Guy has congratulated the National Fieldays Society for another successful event at Mystery Creek in Waikato. “This year’s Fieldays was another success thanks to hard work from Peter Nation and his team, but also in part due to the positive outlook for the primary sector,” says Mr Guy. “Many farmers and growers have dealt with some challenging past seasons, so it was great to feel a really positive mood across the many thousands who entered the gates. There’s a strong sense that many will be looking to use their extra forecast revenue to reinvest in their businesses. . .
Yogis, a self-confessed tractor lover and a hitchhiker are among eight rural blokes in the running to win a coveted Golden Gumboot. The title of Fieldays Rural Bachelor 2017 will be taken out by one young, skilled and single farmer this week. Hosted at Hamilton’s Mystery Creek, the competition forms a part of National Agricultural Fieldays’ three-day event. . .
Mathew McAtamney might have the title, he just doesn’t have the girl yet. The Fairlie farmer was crowned the Rural Bachelor of the Year at National Fieldays at Mystery Creek on Saturday. After a week of challenges against seven other men, the 26 year old took the golden gumboot trophy and won a prize pack worth over $20,000, including a Suzuki King Quad 750 4WD. . . 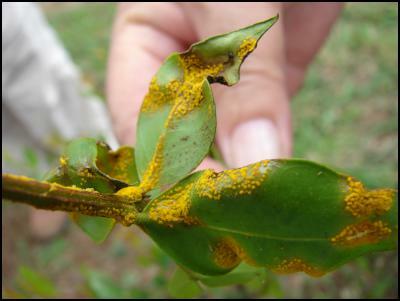 If you see myrtle rust call MPI 0800 80 99 66. New Zealand dairy production has increased by 80% since Year 2000. This has come almost equally from both more dairy hectares and more production per hectare. However, the limits to pastoral dairying in New Zealand have largely been reached. Where do we go from here? First, there is a need to recognise the two reasons why pastoral dairying has largely reached its limits. The most important reason is that society is no longer willing to accept the effects of cow urine leaching from pastures into waterways and aquifers. Huge progress has been made in fencing off livestock from waterways, and in tree planting alongside the streams, but that does not solve the problem of the urine patch. This 2013/14 year is therefore the last year of large-scale conversion of sheep and beef farms to pastoral dairying. New environmental regulations have effectively closed that door. . .
Southland farmers are continuing to be proactive when it comes to changing regulations within Environment Southland’s Water and Land Plan. Mid-Oreti and Hedgehope farmers held a catchment field day recently to discuss the plan and what more they could do on farm to continue to improve water quality. Nicole Sharp reports. How can you make looking after the environment profitable? That was the hot topic at the mid-Oreti and Hedgehope catchment field days recently, where farmers gathered to discuss Environment Southland’s Water and Land Plan and what more they could do. . .
(BusinessDesk) – Less wool than forecast was offered at New Zealand’s weekly auction as farmers held back bales from sale in a weak market. Just 6,821 bales were put up for sale at yesterday’s South Island auction after 11 percent of the expected bales were withdrawn before the sale started, according to AgriHQ. Even with the low number of bales on offer, the clearance rate fell 2 percentage points from last week’s auction to 73 percent, lagging behind last year’s levels, AgriHQ said. . .
(BusinessDesk) – Comvita shares sank 9.4 percent as investment analysts cut their valuation for the manuka honey products maker, coinciding with yet another problem out of the Te Puke-based company’s control with the discovery of Myrtle Rust in the Far North. The shares fell as low as $6.07 in early trading today, the lowest since Jan. 23, and were recently down 65 cents to $6.25 after Deutsche Bank cut its price target for the stock to $7.05 from a previous target of $9. Deutsche Bank owns a stake in broking and research firm Craigs Investment Partners, whose executive chairman Neil Craig also heads up Comvita’s board. ..
Puketapu beef finisher Rob Pattullo was one of nearly 50 leading farmers from across New Zealand and Australia to tour North-western New South Wales recently. Hosted by specialist agricultural bank, Rabobank, the tour group gathered to visit some of the region’s most progressive farming businesses. . .
New Zealand’s iconic oats company, Harraways, is celebrating 150 years of providing Kiwis with delicious oats. Since 1867, Harraways has been operating from its original site in Green Island, Dunedin and remains privately owned. With humble beginnings as a small family business producing flour for the growing population of Dunedin, oats weren’t the company’s sole focus at the time. Replacing the old method of stone grinding flour with an oat roller milling plant in 1893, a thousand tonnes of oats were produced in the first year, expanding Harraways into the breakfast cereal producer that they are well-known as today. . . The introduction of star gazing tours married with the launch of new pools have put Tekapo Springs firmly on the global tourism map. Star gazing tours in one of the world’s top ‘clear sky’ locations was launched by Tekapo Springs in New Zealand’s Mackenzie country just two months ago, taking viewing the Southern night sky to whole new levels. . . Leading honey manufacturer Manuka Health has today officially opened its expanded national apiculture business after a $3.5million build that will significantly expand the organisation’s export capacity. Joining CEO John Kippenberger, the Minister for Food Safety Hon David Bennett opened the Manuka Health Wairarapa Apiculture Centre in an event attended by MP for the Wairarapa, Alastair Scott; Mayor John Booth of Carterton District Council; Chief Executive of Carterton District Council, Jane Davis; industry and government representatives; neighbours; beekeeper partners; site design and build companies; and Manuka Health staff. . .